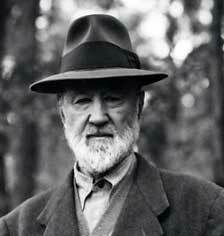 I have long had a casual relationship with Charles Ives’ String Quartet No. 2. I was introduced to his music as an undergraduate, using it as a springboard to find my way into contemporary repertoire after having grown up hearing precious little of anything written post-1913 that wasn’t Broadway, mainstream jazz or pop music. Ives opened up a whole new way of looking at music for me, a child-like way of toying with the material until it satisfied both child and grown-up sensibilities. No matter how eccentric, the result always seemed rooted in simple “what if” questions: If music can modulate from one key to another, why can't it be it two or more keys at the same time? What about two time signatures at the same time? What about two completely different pieces of music at the same time? If the harmonic series is a guide to functional harmony, what happens when we extend it to the higher partials? What about intervals smaller than a semitone? If stacks of thirds produce triads, seventh and ninth chords, could clusters of notes or oppositions of seventh chords -- which could be realistically described as skyscraper stacks of thirds – be used as functional harmony? What about stacks of fourths? What happens when you mix or imitate folk instruments with orchestra instruments? Bel canto and common singing? Does some political or social line get crossed? Is that good? I love these questions. They seem a little transparent to me now, but the lesson I learned from them -- that music is not a goal, but a process of seeking -- has remained a vital one. S.Q. for 4 men--who converse, discuss, argue in re 'Politick', fight, shake hands, shut up -- then walk up the mountain side to view the firmament! 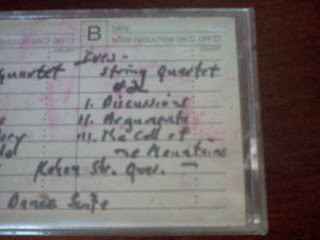 In the 1980s, the String Quartet No. 2 was too much for me. Working in the music library as an undergrad, I had recorded the Kohon String Quartert performance onto cassette tape. I remember listening to it, admiring it and putting it away again. That process happened over and over. Finally, as I moved on to late Stravinksy and the music of the European avant garde composers of the 1950s and ‘60s -- the mid-century men -- I put it aside completely. Driving across Pennsylvania last month -- my great revelations often happen driving across Pennsylvania -- I pulled that same tape out again and turned it on, thankful that my old car still had a cassette player. Listened to the whole thing twice through. What I found was a tender, visionary work, post-modern at the dawn of modernism, post-Romantic in an era dominated by Romanticism, deeply personal where technology and the shadow of industrialized world war were quickly rendering society as a whole impersonal. It shows the versatility of individual imagination, far removed from expectations of genre and style -- the tracings of a free flying mind imprisoned physically and historically by time and place, liberated by imagination. Let’s admit that Ives was influenced by other contemporary innovations, that he strove to define himself as an outsider, to outdo deliberately all others in crazy re-imaginings of traditional methods. Let's note that a near-perverse machismo lay near the root of much of his experimentation, particularly so with this string quartet. Let’s even agree, for the sake of argument, that his eccentricity exceeded his control over the score. I accept all that. No matter. The second string quartet remains a work of remarkable conception, and fluid beauty. It presages Elliot Carter’s fascination with assigning identities to individual voices; its use of stylistic reference and literal quotation has nothing to do with the 19th century and everything to do with the late 20th; it establishes patterns of discontinuity as compositional elements, foreseeing the work of the mid-century; it overlays and juxtaposes in a way that often seems less like traditional polyphonic structure and more like tape-music-style mash-ups; it even lets the instruments step out of character to reveal themselves (with a prescribed imitation of tuning at a critical point), pointing toward the blurring of physical separation between performer and listener that came in the mid-to-late century. All of these are, for Ives’ generation, new techniques, all pursued with a ferocious imagination, a playful yet steady loyalty to the material. I suppose I will never lose my admiration for Ives, whatever personal and professional failings can be ascribed to him. It is hard to believe that I can return to this work after nearly 25 years and find in it so much that is still (or again) fertile ground for further experiment. I wasn’t ready for it in 1988. I am now.